Can’t believe this post was originally posted in 2010. The days when the kids were around and wanted to help with decorating cookies. 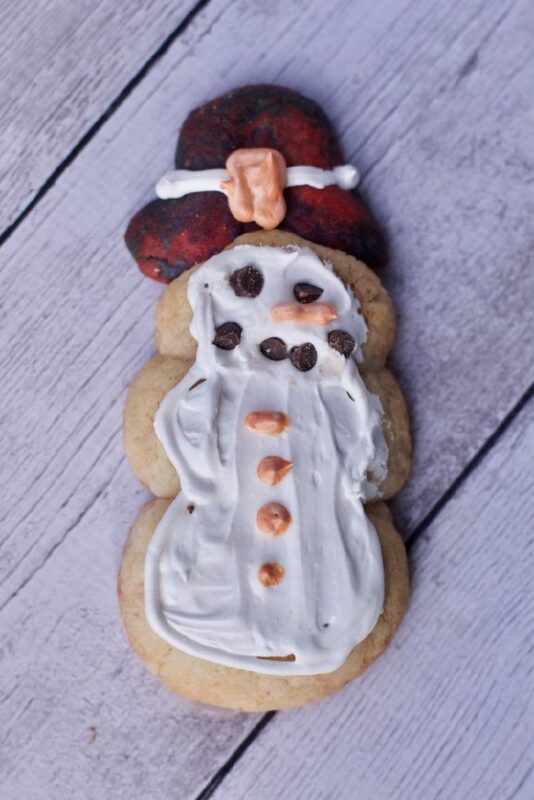 In anticipation for the snow this week, I wanted to test out some fun Snowmen Sugar Cookies that will be Perfect for a Snowday! Even if there is no snow, the kids can decorate the snowman just as well. 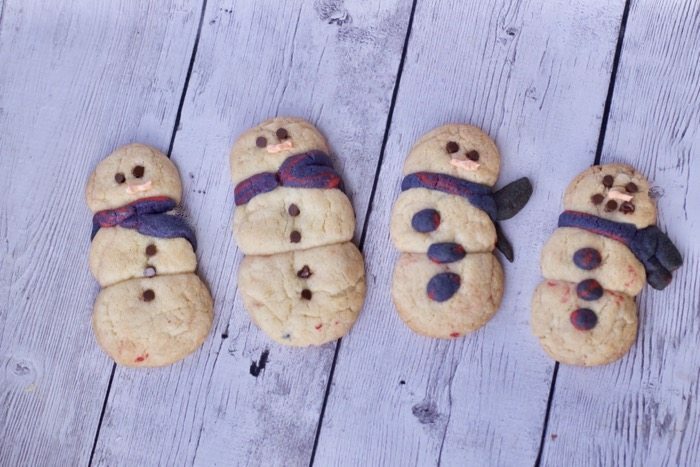 These snowmen cookies were made a little differently since I knew I would be decorating them myself. You still make three balls of your sugar cookie dough and place them together. I used some leftover cookie dough from my Play Dough Heart Cookies and made some scarves and buttons before I baked them. When they come out of the oven, add mini chocolate chips for the eyes and buttons. Use some orange frosting for the nose! 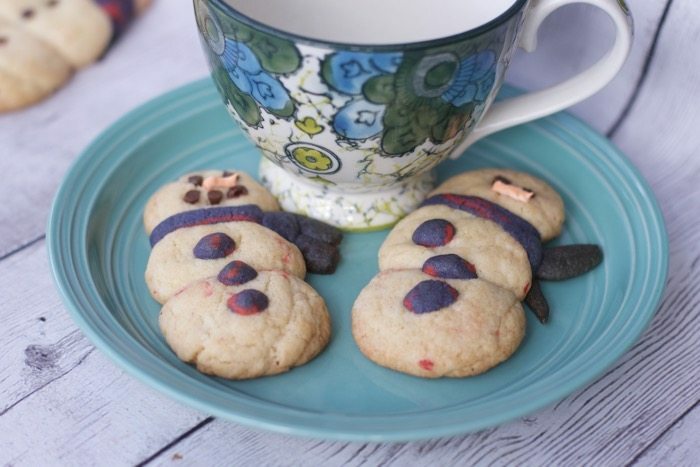 Pin this super easy Snowmen Sugar Cookies to do with your kids or to have for a hot cocoa party. Either way, home baked goods always put a smile on our kids faces. 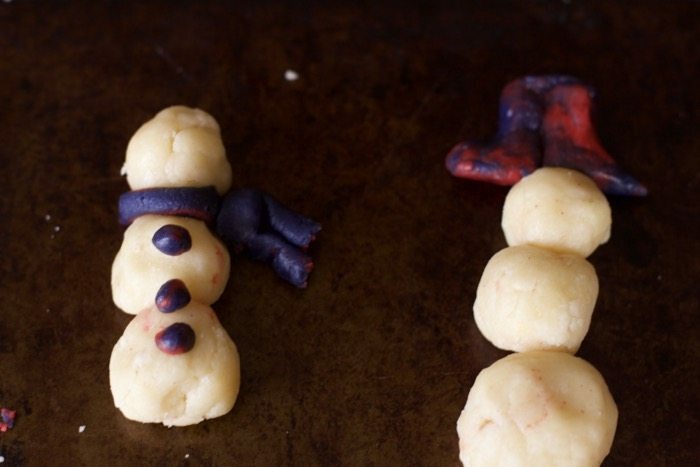 These little snowmen are an appropriate activity for ages 2 to adult. I got a kick out of picking out candies and decorating one too. 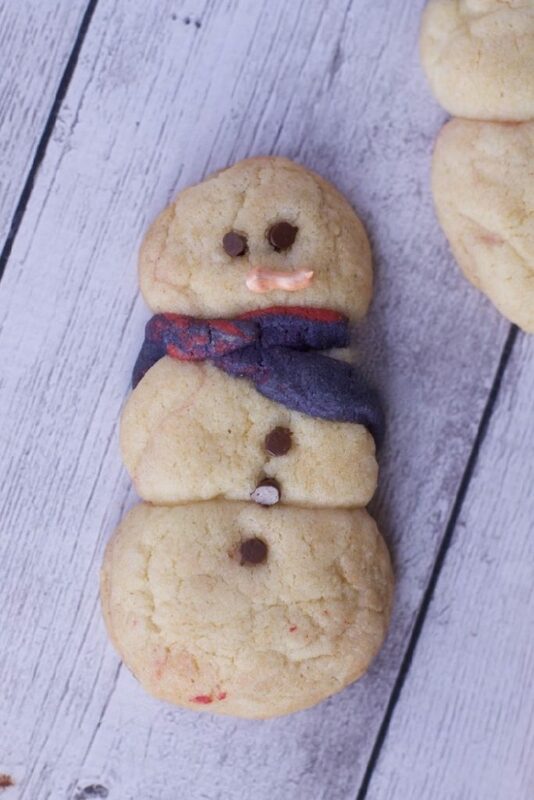 You can use a homemade sugar cookie recipe or the premade tube of cookie dough for this recipe. If using your own recipe you will want to form it into a log and chill slightly. Cut the dough into 18 slices (that is what the premade tube took). Then cut each of the slices into 3 pieces of different sizes. Roll each of the pieces into a ball and flatten slightly. You will want circles approx. 3/4 inch, 1 inch and 1 1/2 inches in diameter. Place them on an ungreased cookie sheet about 1/4 inch apart. Make sure each snowman is 2 inches apart. Once cooled frost the cookie with a glaze of 2 cups confectionary sugar, 1/2 tsp vanilla and 1 Tbs. of milk or water. Mix this together and slowly add additional tablespoons of milk until the glaze is a spreadable consistency. Add the adornments quickly as the glaze will harden. Have fun with the candy choices, you may have everything you would want in your candy jar or left over from the holidays. We used fruit roll ups for scarves, pretzel sticks for arms and brooms, spice drops for noses and hats, brooms tops and buttons, m&m’s and mini chocolate chip cookies. A cupcake tin makes a great container to split up the different candies and you don’t have to worry about it breaking! Here the creations that came from our house. Not in the mood to make cookies, why not place 3 graduated scoops of vanilla ice cream on a plate and let the kids go crazy with the candy. The cold will feel more like snow!! Thought of this as I was writing and unfortunately I don’t have any ice cream in the fridge…. thanks for visiting the site amanda, I really enjoyed these maybe too much and I am older than 23!!! That is so cute. I’m 23 and I want to do that now.